As of March 16th, 2016 iFLY Loudoun is open to the public! Developer Peterson Companies is planning to include a new iFLY tunnel location in their development on Loudoun County Parkway and Route 7 in Ashburn, Virginia. The location was originally set up to be an office building area has since expanded to include entertainment locations to include the tunnel as well as a new Top Golf location. This wind tunnel will be only an hour drive from the capitol - Washington, DC. This location hopes to open its doors to the public in late 2015/early 2016. This information has us estimating that the new Virginia tunnel will be a similar 14 foot model to the new iFLY Houston Woodlands location just opened early 2015. 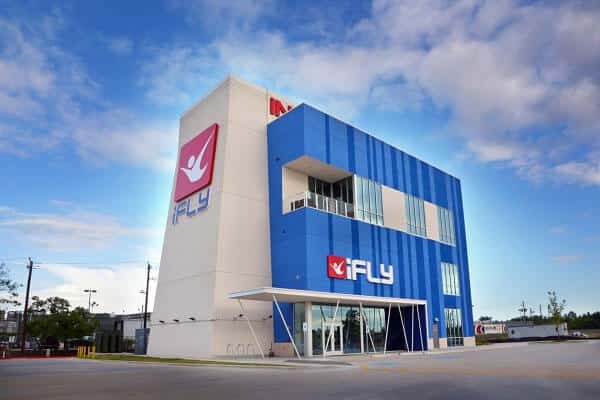 This location will mark the second iFLY location in Virginia, joining the already operational iFLY VA Beach which is a beachfront tunnel in the south-east corner of the state. Average rating of 4.5 from 17 review(s). Great outing for military families assigned to Joint Base Andrews. A very special thanks to Andrea for creating the reservation and accommodating our group so we'll. A special thanks to Dylan as well. What an AMAZING instructor. He was very thorough and very much on point. He kept the crowd moving and everything organized. Everyone had a great experience and the entire staff was very friendly. I highly recommend this facility. THE place to spend morning weekend, specially when weather is not so nice:)it was my second time flying. Great experience! Pete is absolutely amazing! Can’t wait for my almost 3 years old son to fly with us next time! what on earth is better than flying? Listen... we've all had dreams about flying. This allows you to actually do it. It is harder than you think it will be, so pay attention to the instructions. When you put your hand out the window of a moving car, small adjustments will move your entire arm. This is your whole body in here. Long hair... braid and tuck it under your helmet. Open faced helmet - there is plenty of air. You CAN breathe. If your mouth goes dry, it may feel like you can't, but you can. all without a hitch ! AWESOME--Who doesn't like to fly and have the time of their life !! Fantastic facility, Staff is extremely chill. I haven't had the opportunity of getting in the wind chamber, but I am looking forward to starting soon. I am coming at this to prepare myself for skydiving, I hope to find a great trainer at the Loudoun facility. Can't recommend this highly enough!!!! Had a blast! We had such a blast! Fam of five, three kids (5, 11, and 13). All five of us flew and we ended up flying three times with two high flies each... We bought vouchers through Costco for two flights per person, and ended up adding on a two high flies and an extra flight for each. While they do ask you there if you want to, we are so very happy we did. Our flier was Ryan (he likes to go by Pete.. Just kidding, Ryan!). He went through all the safety info and made everyone feel very comfortable. I had trouble scheduling four of us together online, so I had to call to set it up. Had no problems at all and the gal who answered the phone was very courteous and helpful. Super nice. This experience exceeded our expectations and we can't wait to go again!!! By far, this has been the highlight of our family's spring break. Love, love, love iFLY and can't wait to iFLY again. We went today for the ifly. I had two of my kids and one of my friend. They all had a wonderful time except my daughter she got scared and even when she went inside the tube she freaked out and flipped so the instructor took her out immediately. No one actually was bothered to talk to her or even encourage her to do it. Even in the second round. I felt the staff just want to finish the session and that's it. Although I think this is something expected since they allow kids and their should be more trained instructor to encourage kids who get scared. Even when I got out no one has talked to me or her as if nothing had happened. Also no one has asked me if I want a refund or how can we help you since ur daughter didn't do the session. I actually had to go and ask and they refused to refund me they just issued me a voucher for next time. I have told them that I do I don't live here and I don't know if I will do it again but that was only solution they had. And this is after I asked for refund. Anyhow I just recommend more kinder and kids friendly staff who can deal with kids in case they freak out. And refund option for such a case. Such an incredible Rush!!! Ernie was a Great instructor! Highly recommend! There is nothing better than flying with the folks over at iFLY Loudoun! Whether you are a first flyer or a Veteran, let the fun begin. You will gain knowledge, fly free, and get addicted to having the time of your life. Don't wait, don't hesitate. Even if you have never even thought about it, take a chance, you'll be glad you did. Come and join the fun. Bring your family or friends and make an event of it. I would never buy bulk time again. You save a bit of money, but unless you live close to Loudoun, you never manage to use it at decent hours. I surprised my grown daughter with her first flight. It was all we talked about for the rest of the day! The entire staff was great! But, I have to give a big shout out to Ricardo! Thanks for the killer air time! During our visit to see the grandparents, I brought two of my sons for their first flight experience at IFly. It was a fantastic experience from start to finish. The staff greeted us enthusiastically, providing all the details we needed to understand what lay ahead. While we waited for the session to begin, it was great fun to see others taking their flights. During my sons' session, I was impressed with how efficiently the operation ran. The instructor was professional and skilled. The kids had a fantastic time. Afterwards, when selecting the videos, the staff was extremely helpful as I struggled to determine my flyers from the rest of the pack. One staff member in particular went above and beyond to identify my kids and get the videos to me. We will certainly visit IFly Loudoun when we return to the area. The experience was well worth the price. Thank you! We came to celebrate our 39th wedding anniversary on March 26. All staff from check in to flying to check out were wonderful, friendly and helpful. Return packages are a great deal and we WILL be back. Pete was a great instructor and very reassuring. We are telling all our family and friends, "You have to try this!!!" The staff are incredibly friendly and professional, the facility is very clean and modern, and we had an amazing time. First time flyers but will definitely be back, thank you!